The above picture of a Shimano Stradic spool is how I personally like to fill up my spinning reels. To some it would look like there's too much line but I always like giving the reel handle a few extra turns when I know it's full just for that wee bit extra for casting. All too often fishing guests turn up with spinning reel spools that are 'under loaded' which over the full course of the fishing day results in significantly much less water coverage than a properly spooled reel will allow. If you add up 5 yards multiplied by 60 casts per hour by 6 hours in the fishing day you'll get where Im coming from and see that an under filled spool will cost you 1 mile of lost water coverage on a single fishing day. This one is down to personal choice but I personally like nothing more than good old 18lbs test Maxima Chameleon for the vast majority of Tay riverbank spinning or boat harling duties. This is a durable line that has stood the test of time and is the first choice throughout Scotland for many leading salmon fishing professionals and has been for decades! I'll only ever use braid when I'm occasionally fishing one of these beautiful new bass lures as they lack that extra bit of weight that the good old ABU Toby has. I also like a bit of give in a line and there's hardly any in braid. Maxima starts to go pink in colour when its degrading due to sunlight exposure so you'll know exactly when to change it and using light pink coloured Maxima Chameleon is comparable to eating yellow snow! If you're going to have a serious attempt at spinning the Tay don't just turn up and think a few half cooked flicks are going to get you in front of that salmon of a lifetime as that's highly unlikely going to happen. Get a sensible & logical battle plan firmly embedded in your head before you make your first cast and know exactly what your consistent cast range & cast angles are going to be and as importantly know exactly what lure spacings you're going to deploy throughout the full course of the fishing day. Personally I'm moving down through a pool with one rod length (10ft) between casts and casting at a 'slightly' upstream angle to make the lure curve through the mid section of the water column when retrieved. If you keep that going throughout the typical 6 hours of the fishing day you'll cover an amazing amount of water and reduce your odds to close to 'certain' contact from a salmon or two. A salmon isn't going to tear off on a 'reel smoking' 100 hundred yard run on initial contact after taking the lure like a Bohemian bonefish and your initial thoughts for the first few seconds of contact will probably be that your lure has stuck on the riverbed until you feel some movement. This is a vital stage of proceedings and if you're fishing with a slack clutch setting there will not be sufficient hook point pressure on the spinning lure hook points to set it properly. 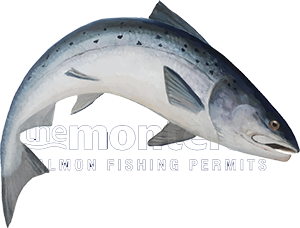 One of the first things a salmon will do is start trying to shake the now 'unwanted' object out of its mouth and it will usually succeed if the hooks are not set properly within the first several seconds of contact. After you've pulled sufficiently to put a good bend on the rod and felt the salmon's weight sufficiently to set the hook then ease off your spinning reel clutch before the fight properly begins.